pueblo exists apart from the large mounds. By the late 16th century, Spain solidified its claim on Mexico and began to stretch its empire farther north into territory the Spanish called New Mexico. 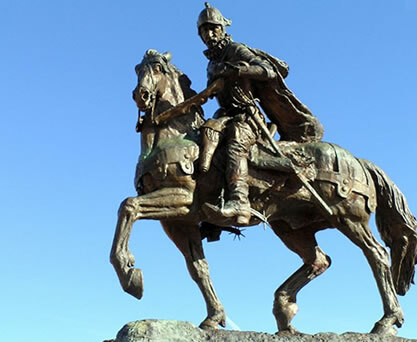 Spanish excursions into New Mexico began in 1540 when Francisco Vasquez de Coronado led a party of Spanish explorers into Pueblo territory, and in 1598, Spain attempted to secure a lasting presence in the region. Don Juan de Oñate, an American-born Spaniard, founded the first permanent European settlement in New Mexico that year. Under Oñate’s leadership, Spanish colonists established the first European capital of New Mexico at San Juan de los Caballeros, at the former site of a pueblo called Caypa. The following year, the colonists founded the new capital at San Gabriel de Yunque-Ouinge. The site of San Gabriel, a National Historic Landmark, is located on the Río Grande in the northern region of present-day New Mexico. Settled in 1599, San Gabriel was the second European capital of New Mexico and seat of Governor Oñate, the first European governor of New Mexico. King Philip II of Spain chose Oñate to represent Spanish and Roman Catholic interests in the new colony. A native of New Spain, Oñate was the child of prominent Spanish immigrants and married to Isabela Cortez, the wealthy great-granddaughter of Aztec Emperor Montezuma II. Philip II wanted Oñate to administer New Mexico as a missionary field for acculturating the Pueblo. Oñate brought 600 people north from Mexico to colonize the region, including Franciscan friars, soldiers, and indigenous Mexicans. In 1598, the settlers arrived in the Pueblo town of Ohkay Owingeh, which they called San Juan Pueblo. Onate founded San Juan de los Caballeros as New Mexico’s first capital that year and established a governing body called the cabildo, or town council. The settlers introduced new crops, like wheat and apples, and animals, like cattle and new breeds of dogs. The next year, the colonists moved their capital San Gabriel. There, they built new houses at an abandoned pueblo site, a garrison, and a church named San Miguel. The New Mexico settlement represented the northernmost colony in the Spanish empire. Once established in New Mexico, Juan de Oñate set out to inspect the newly established province and its pueblos. The Laws of the Indies required that each governor inspect the province at least once during his term of office. In fall 1598, Oñate visited all the pueblos, and through translators, required their allegiance to the Spanish government. In those meetings with the pueblos, Oñate assigned missionaries to each one, thus initiating the Franciscan mission field of New Mexico. Along with the mission regiment, the Spanish introduced a form of taxation, feudal in nature, called the encomienda. Under the encomienda, heads of households in each pueblo were required to pay an annual tribute collected in produce or blankets, to support the defense of the Spanish settlement and the pueblos against raiding Plains tribes, the traditional enemies of the pueblos. Most disturbing to the pueblos was that if the tribute could not be paid in kind, the value of the tribute owed was converted to labor for public works. Missionaries argued that the encomienda interfered with the mission process and opposed its collection from mission neophytes. Under a different policy, Spanish settlers were required to pay an annual tithe, called the décimo, equaling one-tenth of their wheat harvest to support the missions and parish churches. While Oñate's intents were peaceful, relationships between the pueblos and Spanish settlers had already been tainted by the actions of earlier explorers in the 1540s and 1580s, who had attacked certain pueblos. Indeed, Oñate contributed to such ill-feelings after warriors at Acoma ambushed and killed most of a small group of men, who had stopped there to trade for food. Among the dead was his nephew, Juan de Zaldívar. Fearing a general revolt among the pueblos, Oñate sent 70 men, among them Tlaxcalan allies, to demand the surrender of the perpetrators of the ambush. When they refused, Vicente de Zaldívar, Juan's brother, attacked and captured Acoma. Contrary to popular belief, the village was not destroyed, as the Spanish again attacked Acoma in 1613, but, this time, were driven away. Relations thereafter remained uneasy in New Mexico. Meanwhile, because of Oñate's heavy handed punishment of Acoma and his abuses against some of his settlers, he was removed, and in 1609, forever banished from New Mexico. Between 1598 and 1680, before the pueblos rose in a general revolt driving out the settlers for twelve years, relationships ranged from antagonisms to friendships, intermarriages, and religious affiliations. The strain of colonial demands over the pueblos, inclusive of the encomienda, led to a breaking point in 1680. When Spanish settlers returned in 1692, the encomienda, a major cause of the Pueblo Revolt of 1680, was abolished in New Mexico. Statue of Juan de Oñate, Captain General and First Governor of New Mexico, 1598 - 1610. Philip II recalled Governor Oñate in 1606 after Spain received reports from colonists who were dissatisfied with his leadership. Due to his mismanagement of the Pueblo and conflicts with Spanish colonists, the king stripped Oñate of his titles and his land in 1609, and then exiled him from Mexico for four years and from New Mexico forever. The Spanish king later assigned Oñate as an inspector of royal mines in Spain. A new governor took control of the colony and moved the New Mexico capital to Santa Fe in 1610. Though a small party of Spanish colonists may have remained, the Spanish authorities abandoned San Gabriel and the Pueblo reclaimed the site. With the site of San Gabriel lost to scholars, if not to the local Pueblo, American archeologists and historians searched for its location in the late 19th and 20th centuries. In the 1890s, a historian identified the site after comparing 17th century Spanish documents to ruins where local residents of a nearby town claimed the Spanish founded the first white settlement in New Mexico. In the 1930s, the National Park Service surveyed the area for physical evidence of Spanish occupation but was unable to find definite answers. In the 1940s, archeologists from the Museum of New Mexico and the School of American Research studied the site to excavate the adobe ruin. This dig turned up artifacts that suggest that this was the site of a 16th or early 17th century Hispanic settlement. A man from the Ohkay Owingeh Pueblo found a piece of a bronze bell in 1946, and an archeologist identified an object from the site as the crown of a 15th-century helmet. A four-year excavation by the University of New Mexico in the 1960s found evidence of a military garrison, kitchen, and church in the ruins. During this dig, the UNM archeologists excavated 65 rooms and found evidence of a Spanish military garrison, domed adobe ovens called hornos, blacksmithing, and the San Miguel church. Some of the artifacts that marked the Spanish occupation include an engraved gunstock, a 16th-century gilded bronze religious medal, chain mail, majolica, and candlesticks. Artifacts like a comal, or native stone griddle, a broken three-legged Mexican metate, an obsidian scraper, and charred animal bones -- mostly domesticated cattle. These objects provide evidence of what the colonists ate and how the community began to use local native objects for their daily needs, on account of the distance the heavy basalt metates, herds of cattle, and painted Mexican pottery had to travel. Archeological evidence demonstrates that the Spanish community lived in two story adobe room blocks and maintained some degree of social hierarchy among themselves, where certain areas were living spaces for laborers and others for officers. The adobe rooms had been taken from previous Pueblo inhabitants. Archeological evidence shows that the Spanish altered the original architecture to fit their needs; the lower rooms originally could only have been entered by a ladder from the ceiling, but the Spanish colonists cut doors in the walls of the ground level floors. After these archeological investigations, San Gabriel fell into greater ruin. The residents of Ohkay Owingeh removed adobe from its exposed walls to use elsewhere. In 1984, the ruins of San Gabriel were leveled and the land used for alfalfa production. 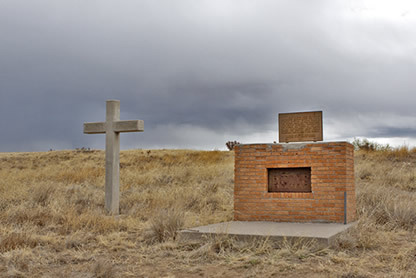 Today, a cross and a memorial mark the site, which is accessible to the public. Across the Rio Grande from the site of San Gabriel is the Ohkay Owingeh Pueblo. Home to Tewa-speaking people, this village offers visitors lodging at the OhKay Casino and a chance to see Pueblo arts and crafts. A replica of the San Gabriel Mission is located in Española, New Mexico, south of Ohkay Owingeh, and serves as the Misión Museum in the Plaza de Española. San Gabriel de Yunque-Ouinge, a National Historic Landmark, is located just west of San Juan Pueblo and the Rio Grande, on New Mexico State Road 74, 25 miles north of Santa Fe, NM. For more information about the San Gabriel replica, visit the Plaza de Española website. Hispanic life in northern New Mexico is the subject of an online lesson plan, The Hispano Ranchos of Northern New Mexico: Continuity and Change. The lesson plan has been produced by the National Park Service’s Teaching with Historic Places program, which offers a series of online classroom-ready lesson plans on registered historic places. To learn more, visit the Teaching with Historic Places home page. San Juan Pueblo is featured in the National Park Service American Southwest Travel Itinerary.